As I try to squeeze in a few minutes here and there to climb the mountain that is Christmas preparation, I am reminded of what I was doing this time last year. This suitcase is full of slides taken by Andrew Henry's father from about 1955 to around 1973. They are beautiful images of family, friends, weddings, births, holiday's - moments in the lives of many. 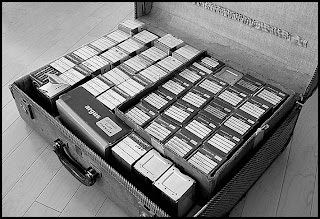 I took on the task (at the request of AH) of scanning each of these slides so we could make cd's for his many (many) family members. It took me about 4-6 hours a day for the better part of three weeks to scan them all but, as with so many things in life, it was worth the effort. At the time, I was annoyed at how much time it was taking to get this job done and wondering why it had fallen on me to do it - silly girl I was. It was an honor to preserve something so special to Andrew Henry's father (an AH of course), those darn blessings - why do they sometimes have to be so well disguised? I'm adding the scanner info because I've had a few inquiries. I scanned them at home with an Epson V300PHOTO scanner. This has worked great for us - you can scan slides or prints straight to your computer. There are many out there but this is what we bought, I found it easy to use and it has more than paid for itself. Found one on Amazon if you're interested - you can check it out here. A labor of love, indeed. I have boxes of carousels of slides from this same time period that I inherited when my grandfather passed away a few years back. I need to invest in a scanner. Can you recommend one? How WONDERFUL! I love them all - but my faves are the car and that cowboy (AH?)! Funny how the most difficult things in our lives most often turn out to be the biggest blessings. God's sense of humor maybe. I have learned along the way that the things I work hardest for or put the most "labors of love" into are the things that I cherish most. Fine example you have here. 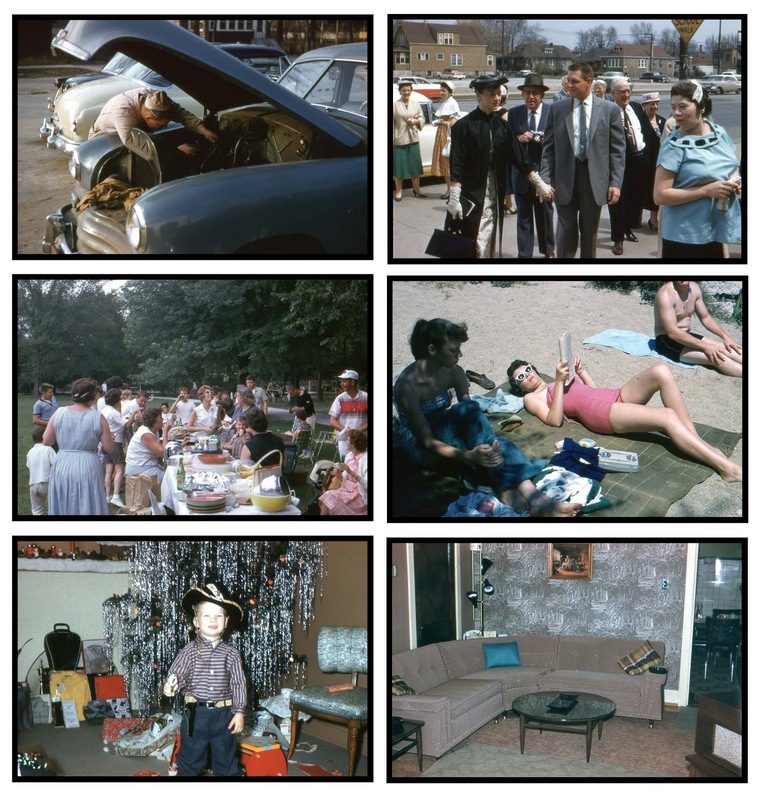 Memories and classic images - what a wonderful job you did to preserve them all! Ha, nope AH is not old enough for that 50's shot, that's one of his cousins. The car shot is great, there were many of the mid-century gas station, very cool. Oh what treasures! I love old family photos. I have boxes of old family photos - some over 100 years old. Not many slides though. There is something magical about slides. What treasures you have recovered. I bet the rest of the family willl be thrilled. Wow, I love looking at old photos! I did an old slide show of photos of my grandfather for his visitation a few weeks ago. Love the fashions in the first pic! That living room shot could almost be of a room of today! Great pics and the viewing of all those slides you scanned last year was so wonderful! How absolutely beautiful that you got to handle this project. I also never got to meet my significant other's father (who passed away before we met), but he passed on a similar treasure trove of family slides and we've yet to scan them all. I'm so inspired by your tremendous labor of love! They are truly incredible, and such a unique way to get to know your parents. Wow how cool are those pictures!? Oh I love this! You know me and old photos go hand in hand! I should have said the fashions in the second pic! An amazing gift that fell in the lap of the perfect person!!! What a bond between you and the spirit of your Father-in-law. You should Cynthia and when you do, I hope you'll share them on your blog! Also, you have a box full of vintage scarves? oh gosh, you should sell them, they would go like hot cakes! Rinkly Rimes - I've got more if you need anymore inspiration, plenty more! These are seriously incredible! I can understand that it was kind of a burdon placed on you but it must have been so neat to look through those and get to know his family that much more. So cool! That is so lovely. And thanks for the info on the scanner! I need a better one! You did a fantastic job with this labor of love. It was a marathon effort for sure. There were thousands! There is a certainly peace of mind knowing we have been able to share these pictures with the rest of the family and they won't just be lost in an old suitcase. what a treasure. troy did that for us with family video / photos. what a very mod room in that last shot! How lovely! I can imagine it was amazing to go through them all and to see life captured back then. It's great that you enjoyed the task in the end. A blessing in disguise for sure! Not sure if my previous comment came through so putting it in again. The pics are fantastic like still shots from my favourite tv show Mad Men. I love that Don Draper he maybe a louse but hes yummy like scouse!!! Fabulous - love looking at vintage photos! !